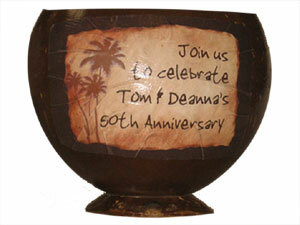 Coconut Label Service - Brand your coconuts very inexpensively - starting at $4.99 each. 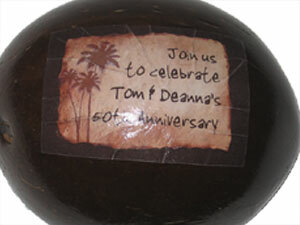 Due to the convex shape of the coconut, stickers may overlap slightly on the ends and very small wrinkles may appear in the label. However, this blends well with the imperfect shell of the coconuts. Minimum order is 12. Maximum label size 2.5 x 3 in. These are natural items, safe for food and drink. Handwash only. Minimum order is 10. Maximum label size 4 x 4.25 in. Genuine Kukui Nut Leis will last a lifetime. These gorgeous leis are customarily worn by royalty as well as wedding guests through the nations of the Pacific. Minimum order is 12. Maximum label size 2.5 x 3 in. These are natural items, safe for food and drink 4-6 inches in length. Handwash only. Minimum order is 12. Maximum label size 2.5 in. wide x 2 in. tall. These are natural items, safe for food and drink. Handwash only. For those who cannot decide, send a gift certificate! Gift certificate notification letter will be sent to the email address in the comments section. We send the appropriately sized stand for your product. 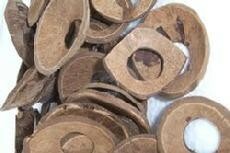 Coconut Shell Disks (approx. 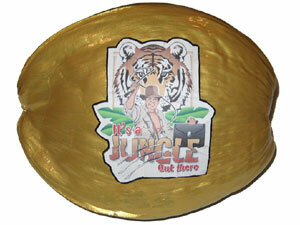 3 1/2", 1 1/2" hole) or Round Wooden Ring (2.2" round). 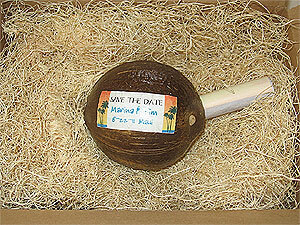 Custom painted coconuts make a unique statement, unforgettable invitation, and eco-friendly promotional incentive gift. Since 1996, making someone's day a whole lot better, one coconut at a time.